My dissertation has a new leading man. 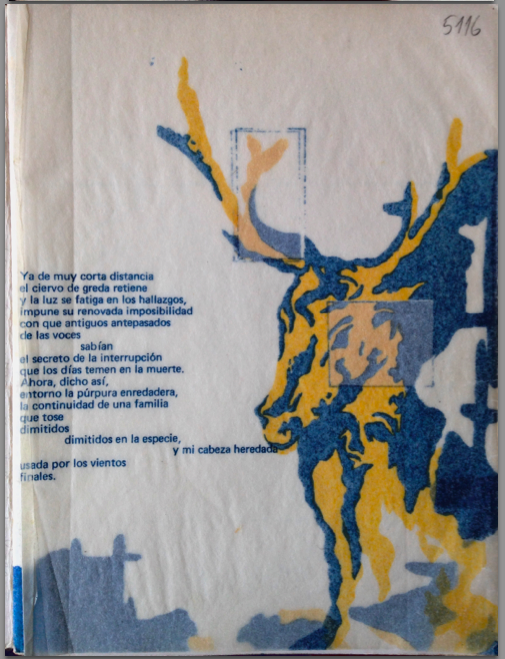 I had been sensing this shift for the past few weeks as I drifted farther away from Godofredo Iommi’s poetry and into the waiting arms of Alberto Cruz’s maps. Of course, I have always been about the maps. It’s just that Iommi has a consuming way about him; from his stint on television, to his captivating poetry, to his Homeric presence in photographs he is difficult to ignore. And today, after finding the most charming edition of his poems, I know I’ll never fully break away from him. Godofredo Iommi, Ocho de enero de mil novecientos setenta y seis. Valparaíso: Taller Imprenta Escuela de Arquitectura UCV, 1977. The School of Valparaíso’s library is full of in-house published texts by previous and current faculty. Even though I thought I had exhausted the catalog search, I managed to unearth random texts by Iommi and others. 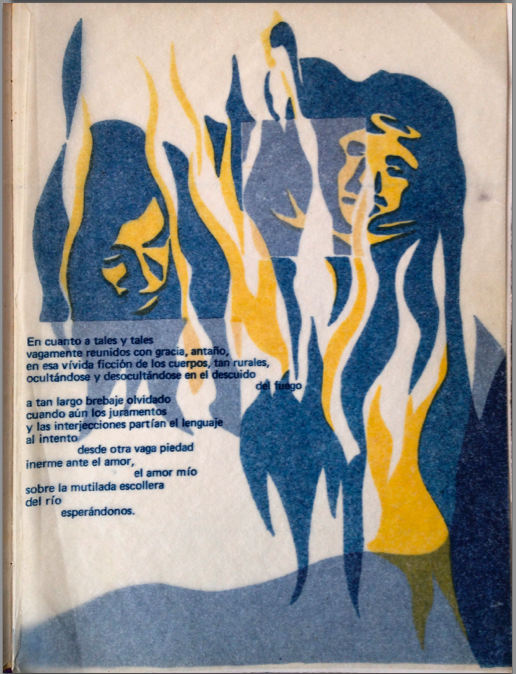 Ocho de enero de mil novecientos setenta y seis [January 9th of 1976] (1977) is a six-page book of poetry, illustrated and arranged by Herminia Bencich who was a Graphic Design student at the time. I hope Benchich received full marks because her work is outstanding. The scans don’t really do it justice since there’s a layer of tracing paper (with colored drawings) over a background with similarly colored abstract shapes, like in the first illustration. The second illustration is my favorite since it’s how I think of the 1970s: pensive brunettes with their long hair cascading down their face, like Jennifer Cavalieri or Annie Hall. I don’t think any translation would do Iommi’s work justice, so I’d rather leave it as is.